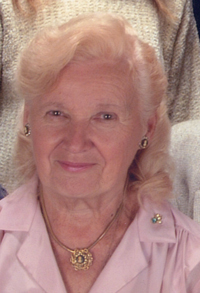 Obituary for Mary Frances (Drdak) Sterling | D. J. Robb Funeral Home & Cremation Centre Ltd.
STERLING, MARY, FRANCES (Drdak), - Peacefully at home with her family at her side, Mary Frances Sterling, passed away peacefully at the age of 89. Predeceased by her husband Kenneth Edward Sterling (2005), her mother Maria (Mary) Drdak and 11 brothers and sisters. Dear mother of Ed Sterling of Forest, Ken Sterling and his wife Selina of Corunna and Cathy Sterling and her husband Ed Collins of Sarnia. Missed by her grandchildren; Jamie (Eric), Kaitlin (Jon), Haley (Bryan), Spencer, Mariah, Bryan (Alanah), Amanda, Joshua, Courtney (Chris), Brett and great grandchildren; Lucas, Jack and Olivia. The family would like to thank Dr. Cornelia, Dr. Kim, the nurses on the Palliative Care Unit of Bluewater Health, Bayshore Health and Care Partners. Mass of Christian Burial will be celebrated by Father Mathew Sobierajski on Tuesday, April 2, 2019 at 10:00 a.m. at Our Lady of Mercy Catholic Church (390 Christina Street, North, Sarnia). Interment will follow at Our Lady of Mercy Cemetery. Family and friends may visit at the D.J. Robb Funeral Home & Cremation Centre (102 N., Victoria Street, Sarnia) on Monday, April 1, 2019 between the hours of 2 – 4 pm and 7 - 9 p.m. In lieu of flowers sympathy may be expressed through memorial donations to the Alzheimer’s Society or a Charity of Choice.